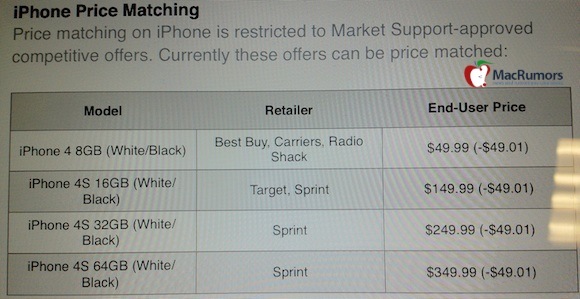 With a number of retailers and carriers beginning to drop prices on the iPhone as the introduction of Apple's next-generation hardware approaches, Apple has officially continued to maintain standard on-contract pricing of $199/$299/$399 for the iPhone 4S, $99 for the iPhone 4, and free for the iPhone 3GS. But a source has now revealed to MacRumors that Apple's retail stores have been given authorization to match these discounted prices from approved major retailers and carriers. In all cases, Apple will discount iPhone 4S and iPhone 4 models by $49.01 upon request to bring pricing down to $349.99/$249.99/$149.99 for the iPhone 4S and $49.99 for the iPhone 4. As with most price matching offers, consumers will likely need to cite the source offering the lower pricing in order for Apple to honor the price match. Notably, the price matching policy applies only to Apple's retail stores and is not available for orders through the online store. I would like to see the monthly bill reduced instead. Maybe $20 or $30 less per month. Cool. Glad we're focusing on things Apple can control. Steve would have never allowed this. Great! Let`s empty those phones that were stocked before the next one! Get an iPhone and go on StraightTalk. Carriers aren't angels... but really... they need to make SOME money off of you. What network? What do you get for $23/month? T-Mobile has a nice 100min/5GB data plan for $30.